Last Friday I was asked “how does a CDN work?” The first time I was asked the same question was year 1999. I acquired a lot of CDN knowledge and experience since I join the industry in 2012. CDN is not yet an everyday business in Asia nowadays. I want to help. An one page brief explanation. Hope you like it. A Content Delivery Network (CDN) is a collection of web servers distributed among multiple locations to deliver content to users more efficiently. What is the job to be done by CDN? To send web content to enduser faster. How? By moving data close to the endusers to reduce round trips and network. Latency, not bandwidth, is the performance bottleneck for most websites. To improve performance of our applications… we need to reduce round trips, move the data closer to the client. In essence, CDN puts your content in many places at once, providing superior coverage to your users. For example, when someone in London accesses your US-hosted website, it is done through a local UK CDN server. This is much quicker than having the visitor’s requests, and your responses, travel the full width of the Atlantic and back. By connecting users who request your website content to CDN, instead of connecting directly to your web server. The resolver will then ask the authoritative DNS sever of abc.com what is the IP address of www .abc.com and will get the answer of 1.1.1.1. Say there is another user Mary in Singapore going to browse www .abc.com, we will have the similar four steps, but the CDN provider will use, say 3.3.3.3, which is the IP address of the CDN cache server located in/near Singapore which can serve Mary most efficiently. Do I need to upload my website content to CDN? Not necessary. In most cases, CDN will on-demand fetch content from the Customer Origin. If no, then the cache server will fetch the content from the Customer Origin, then store it and send it to the enduser. We call the situation of missed content “Cache Miss”, and the process of fetching content from Customer Origin “Cache Fill”. CDN will Cache Fill when it needs to update the stored content. The higher the Cache Hit rate, the faster the content delivery. High Cache Hit rate better utilizes CDN and reduces Customer Origin loading. How long will the CDN keep my web content? CDN provider will usually honor the Cache-Control header setting in Customer Origin. During the Cache Fill process, the CDN cache server will cache both the web content and the HTTP header information, including the Cache-Control header attributes. CDN provider will keep the content according to the Cache-Control setting or based on the customer CDN configuration. Higher availability by leveraging CDN’s global footprint and scale. More secure by shielding the Customer Origin from public access. I prepare this blogpost on the new iPad Pro 10.5” with Smart Keyboard. It is GREAT. Looking forward to iOS 11! In my previous post I showed how to use HolaCDN to improve the performance of a mp4 video which is already accelerated using CDN service. This time I would like to show how to use HolaCDN MultiCDN feature to improve the performance of a multi-birate HLS video. 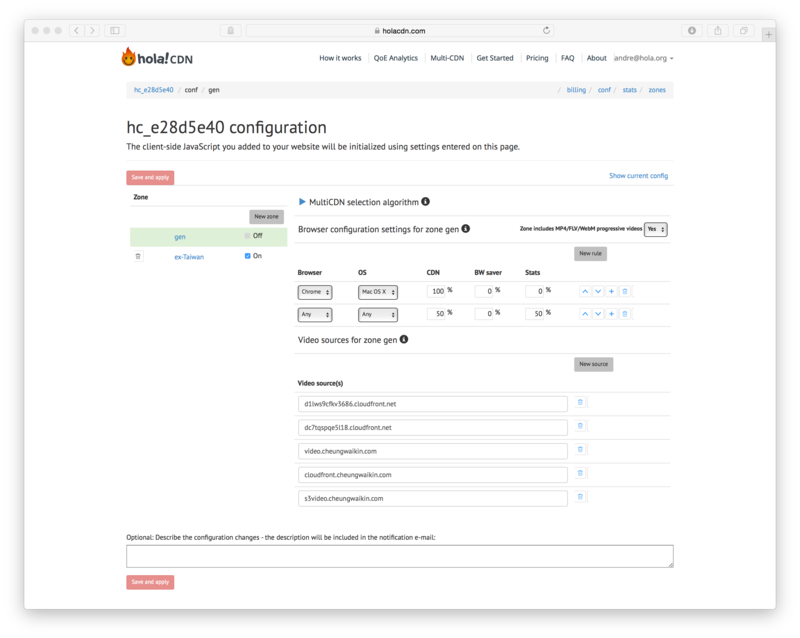 HolaCDN MultiCDN will automatically measure performance of multiples CDNs (defined by user) and select the optimal CDN to use. In this demo, HolaCDN will select among the customer origin, a 3rd party CDN and HolaCDN. 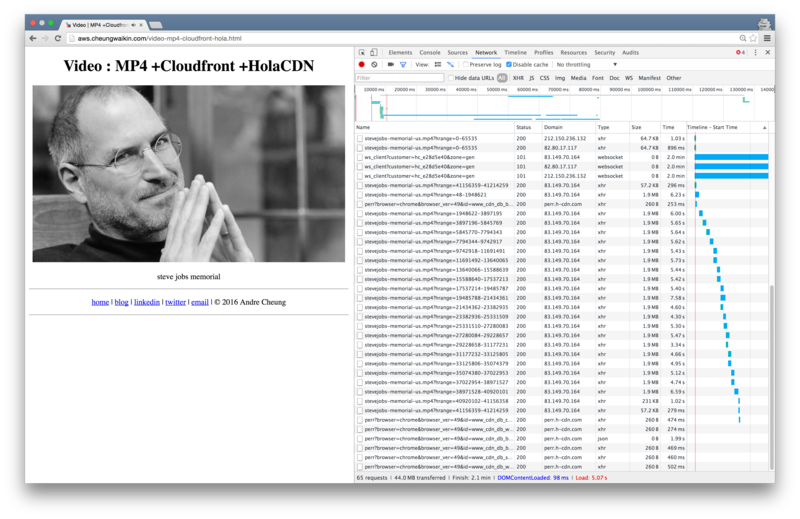 In the screen capture below, Chrome Developer Tools shows the HolaCDN JS client loads video chunks from serveral hosts: s3video.cheungwaikin.com (customer origin), dc7tqspqe5l18.cloudfront.net (a 3rd party CDN) and 76.73.18.98 (a HolaCDN server). 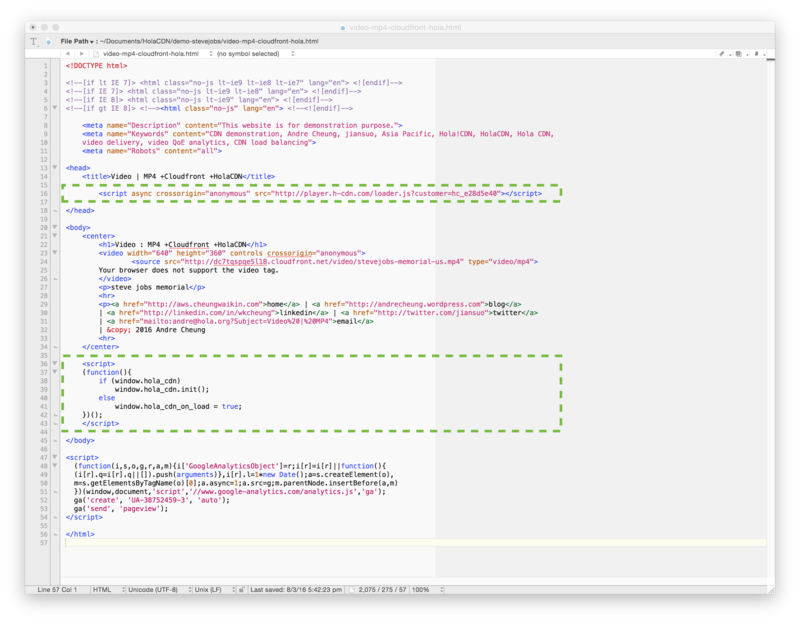 The following picture shows the result generated by the command hola_cdn.get_stats() in the Chrome Develop Tools Console: 20% of traffic is from the customer origin, 18% from the 3rd party CDN, and the remaining is from HolaCDN. How to set up HolaCDN MultCDN feature in this demo? Step 1: create a new Zone named “hlsmulti” by defining the Page URL as http://aws.cheungwaikin.com/video-hls-flowplayer-cloudfront-hola-origin.html. Step 2: in the MultiCDN selection algorithm, I input the $0.5 as the cost of HolaCDN and $0.05 as the cost of “My existing CDN”. Doing so to instruct HolaCDN to use My existing CDN unless HolaCDN improve performance (better video start/seek time, less buffering, higher video quality/bitrate). Step 3: for demo purpose, HolaCDN will take actions – collects QoE statistics and deliver video content – if the user is using Chrome browser. For every 100 pageviews from Chrome users, all will colllect QoE statistics, and HolaCDN will try to deliver video content in 90 pageviews. Step 4: define “My existing CDN”. In this demo, the are two “CDNs” – dc7tqspqe5l18.cloudfront.net and s3video.cheungwaikin.com. Step 5: I use Static MultiCDN switching mode. If HolaCDN finds dc7tqspqe5l18.cloudfront.net and s3video.cheungwaikin.com perform better than HolaCDN, then 50% possibility that video will be retrieved from dc7tqspqe5l18.cloudfront.net and 50% possibility that video will be loaded from s3video.cheungwaikin.com. Want to try it yourself? Go to apply a HolaCDN free trial account now! Hola is a Spanish word meaning Hello. Hola! is a startup headquartered in Netanya, Israel. Hola!’s goal is to make the web faster, more open and cheaper to operate. Hola!CDN is the first CDN purpose built for video. It is developed and operated by Hola!. Hola!CDN makes Internet video delivery Faster, Cheaper and More Reliable. It is my pleasure to share with readers that I am now working at Hola!CDN! In my last blogpost I talked my first Israel visit. The main objective of the trip was to attend Hola!CDN training. 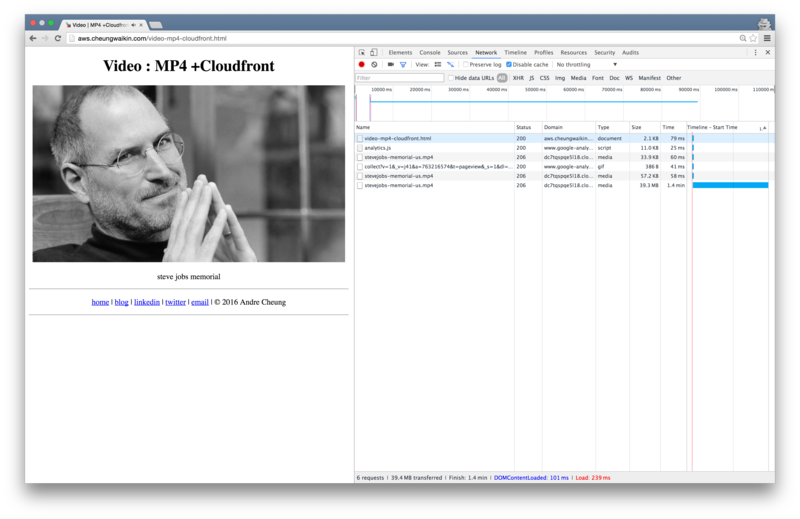 In this blogpost I would like to SHOW how to implement Hola!CDN in a webpage with MP4 progressive download. Step 2: configure Hola!CDN service. The minimum step is to add your Video Source(s). Video Source is the hostname of the CDN or customer origin that your video is cached/stored. Three steps. That’s all. No DNS change is required! There are 6 HTTP requests in the original page and 65 in the page implemented Hola!CDN. Why? Let’s talk more next time. Browser Compatibility. Flash Video with HTML5 Fallback. It is good to learn some acronyms, here is a great Video File Format Overview. My demo site demo.cheungwaikin.com was launched about two years ago in Nov 2012. The objective was to show how to use EdgeCast services to increase web performance. The demo site is for myself and my customers. It is my pleasure that there are people find it useful too. I used Mac and iPhone to develop the demos. I tested if the demos were compatible on OSX and iOS. That’s all. I didn’t spend much effort in cross-platform compatibility, until recently. I received compatibility questions from visitors and they told me that my site did not render correctly on IE. I have a coming project on 13-Nov-2014 which requires cross-platform browser support. Now is the time to spend more effort on compatibility. From Google Analytics I know that most of the demo site visitors are PC desktop users and using Chrome. From NetMarketShare, IE 11 is the number one in desktop browser popularity. Large portion of mobile users are on iOS. In order to help most of my demo site visitors to see the site correctly, I think I have to support IE 11 and Chrome on Windows 7, Chrome/Safari/Firefox on OS X, as well Safari on iOS 8. 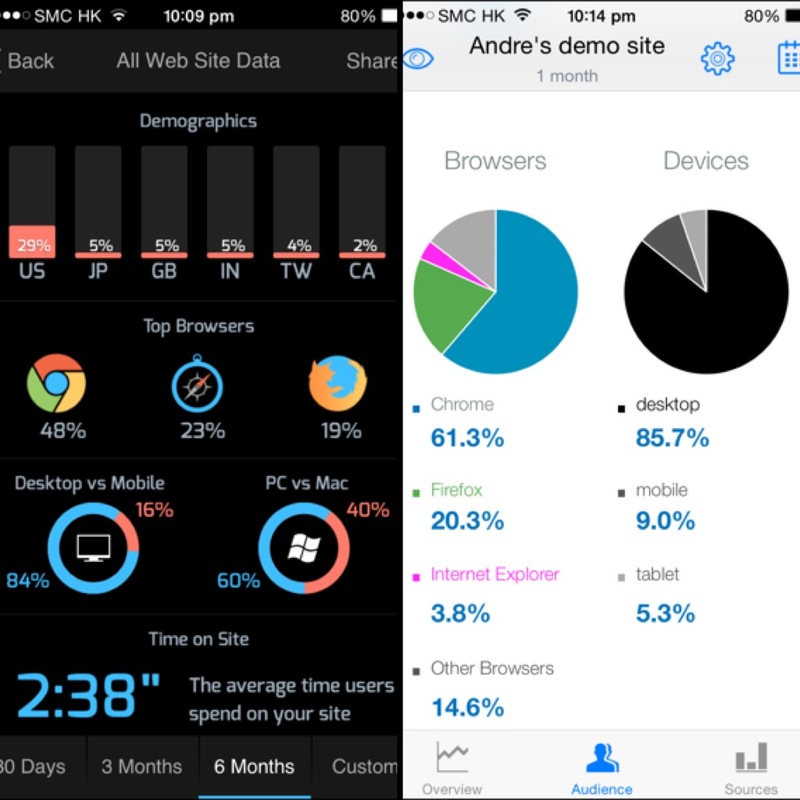 Users demographics from the app Analytiks and Analytics To Go. 6 browsers. And a lot of work! They support different content formats. For example, regarding videos, Safari on OSX and iOS support mp4 and m3u8 while IE/Windows, Chrome/OSX and Firefox/OSX do not. In order to have my video demos work on these 6 browsers, they have to support Flash video for desktop users, .m3u8/.mp4/.webm for mobile users. 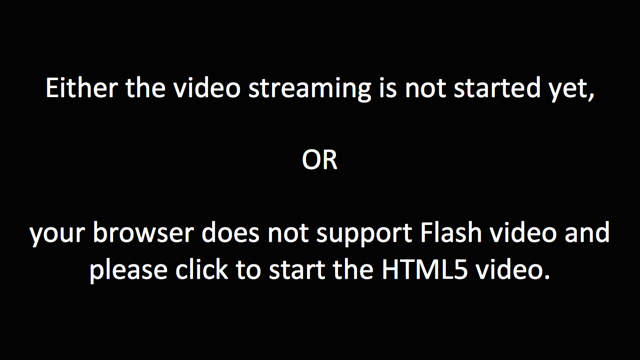 Or in more professional wordings, I need a Flash Video with HTML5 Fallback strategy to cater my user demographics. Assuming desktop user is more probable, my site will try to send Flash video content via RTMP first, then send .m3u8 (for live streaming), .mp4 or .webm (for VOD) if Flash video is not support by user device. It is cool that I check these two demos work on IE 11/Windows 7, Safari/Chrome/Firefox on OS X 10.9 and 10.10, as well as iOS 8! My demos are now much more user-friendly. For my mid-Nov project, software part is ready. I need to prepare the hardware portion. Let’s talk hardware next time!